Over 100 years ago a small group of people, led by a priest and his family, entered onto the grassy fields of Orchards, and ‘took guard’ for Christ. The worship services began in the Norwood School Hall in 1906. That same year the first marriage took place in the Hall of the “Afrikaans Church”. And, in a fairly short space of time, the small church of St Luke’s, designed by Sir Herbert Baker, was erected on the present site. The land was donated by William Anderson Martin who owned 18 acres in the area now known as Oaklands and Orchards. Of the £1350 that were needed, £500 was raised through appeals. The balance of £850 was provided as a loan by Mrs Carter, wife of the first Rector of the parish, Fitzwilliam Carter. That loan was only finally repaid to her some 20 years later. St Luke’s celebrated the centenary of the congregation throughout the year of 2006, with a number of functions and guest speakers. These included the Dean of the Cathedral, the Very Rev Gerard Sharp, the Bishop of Bloemfontein, Bishop Paddy Glover, son of a previous Rector, and the Bishop of Christ the King, Bishop Peter Lee, himself a previous Rector. Bishop Brian Germond, the Bishop of Johannesburg presided at the St Luke’s Day celebrations. As a part of the centenary year it was decided to honour the wonderful contribution made to the life and ministry of the parish by the wives of the Rectors – starting with Elfrida Carter and the very generous loan that she had made and which had enabled the church to be built. The Wall of Remembrance is dedicated to their memory and honour, as follows. The Wives of the Rectors of this Parish during its first century. This is in grateful recognition of the invaluable contribution that they have made through their love, commitment, and faithfulness. It acknowledges too the many sacrifices that they have made in service of our Lord and God and in ministry to His people. Fitzwilliam Carter was born at Shelton, Stoke-on-Trent, England in 1873. His father Conway R.D. Carter was, according to the 1881 British Census, a “clerk in holy orders” and the “district organizing secretary of Additional Curates Society, Witho”. His mother was Georgina M. Carter [nee Shorland]. He was the second of 8 children – in order: Kathleen; Fitzwilliam; Herbert; Norah; Bryan; Ina; Noel; and ? He was educated at Magdalen College School and thereafter at Oxford University. He obtained his B.A. degree in 1898 and his M.A in 1908. He was ordained deacon in 1890 and priest in 1901, by the Bishop of Salisbury. From 1899 to1902 he held the curacy of Bennerton, Wiltshire, the native parish of George Herbert, the poet. In May 1902 Fitzwilliam had been on the point of sailing for South Africa as an army chaplain. 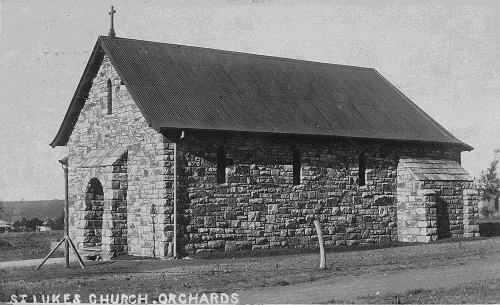 With the end of the Anglo-Boer War he was invited to join the clergy attached to St Mary’s Church, as it then was, in Johannesburg. In that capacity he was to serve on the staff of St. John’s College, about to re-open after having been closed for two and a half years. The College, catering for about 180 day-boys was headed by the Rev. J. L. Hodgson. As a result of the educational policies instituted by Lord Milner, the number of students declined to approximately 70. Mr. Hodgson fell ill, and was recalled to England, and Mr. Carter was asked to take over as Headmaster in January 1904. He held the reins until the Community of the Resurrection took over at the end of 1905. It has been suggested that without Mr Carter’s faith and dedication St John’s might have closed before then. Writing to his daughter Hilda on 9 November 1948 he said, Many thanks for the latest snap of P.J. He seems to be getting on famously and I am proud of my grandson. Also many thanks for the cutting about St Johns. Yes they have missed out the effort of yours truly without which there would have been no St John’s College today. At the request of various people I have twice written the story of those days and presumably the authorities have the story in their records. Unless I and some of the staff had put a huge foot in the door at the end of ’03 , the school would have been closed when Mr. Hodgson resigned. I took over then and carried on until the beginning of 1906 when the C.R. was ready to take over. It is a long story and I cannot write it again here but it was quite an exciting time for us and the present School is our justification and reward. At the same time I was developing the work round Norwood and when St John’s closed we went down and lived in Victoria – close to Orange Grove – and there Elfrida [?] was born. By Oct.’07 we had built St Luke’s – early in ’08 the first Vicarage was up and in ’09 we moved to Pietersburg where you were born in ’10. We spent the summer of ’08 in England so we got through quite a lot in the time available. By 1911 we had secured a Rectory for P’burg and in ’12 came home to England for good. Looking back it seems to me almost incredible, but Mum and I were young and things moved fast in S.A in those days. I am sure one could not have done it in England………………. Joanna Frances Magdalen born on 21 October 1904 in Johannesburg. She was baptized by Revd J.T. Darragh C.R. on 15 November 1904. Her god-parents were Charles Lane Samson, Edith Kamble and Kathleen S. Peacock. Hilda Madeleine born on 6 December 1910 in Pietersberg. and Robert Lees Evan Fitzwilliam was appointed by the Bishop of Pretoria, Bishop Carter, to take charge of a new district called the northern suburbs of Johannesburg. Mr Carter lived, initially, in Victoria, just south of Norwood. He planned to develop church work in 30 suburbs from 3 centres. Services were held in the original Norwood School building, and then in the Dutch Reformed Church in what is now their Hall. Other services were held in areas to the east and west of the present parish of Orchards. Mr Carter very quickly identified the need for a church building of its own for the parish. Plans were drawn by Herbert Baker of the firm Baker and Massey. The cost of the new building was estimated at £1350. Of this amount, £500 was raised through appeals. The balance of £850 was provided as a loan by the Rector’s wife, Elfrida Carter. This loan was only finally repaid to her some 20 years later. The first Confirmation service at St Luke’s was held in December 1907. When Mr Carter left the parish in 1909, having been transferred to Christ Church, Pietersberg, he left it firmly established, although still in debt to his wife. He returned to England in 1912. In the first year of the First World War he served as a chaplain aboard the Naval Artificers Training Ship, Fisgard, at Portsmouth. He moved to Withleigh, near Tiverton, Devon, as vicar, in 1915. 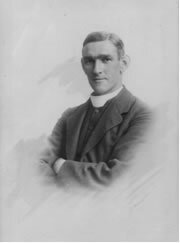 He held the living of Calverleigh, as rector, from 1917. Interested in the welfare of young people, Mr Carter did much to establish youth movements in the area. At Withleigh he was the prime mover in the founding of the Young Farmers Club, one of the first in the country, and was also a scoutmaster of the Calverleigh troop. As honorary Chaplain to Ingleside School while it was at Calverleigh, he trained a team of bell ringers at the school. This was probably the first team of girl ringers in the country. 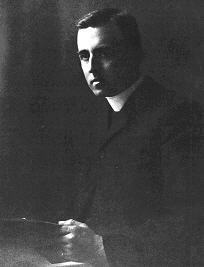 He was appointed as Rural Dean from 1925 to 1929. He continued to serve the area until his retirement in 1944. After his retirement he served as one of the Bishop of Exeter’s special service clergy. He died on Saturday, 23 October 1954 at Tiverton at the age of 81. He had been seriously ill for three weeks. His funeral service was held at Withleigh Church on Wednesday, 27 October 1954. When Mr Lycett was appointed the parish was receiving a grant from the Diocese. By October 1911, things had changed and the Diocesan Finance Board expressed their gratification on receiving a letter from the parish expressing their willingness to forego the annual grant of £25! The Rector’s transport in those days was a bicycle and one parishioner remembered Mr Lycett riding home with a leg of mutton attached to his saddle bag and wondered if this was a new way of caring for his sheep! The parish was already expanding and the work increasing. The Diocesan newsletter, The Kingdom, noted that “the extended district was probably too much for Mr Lycett unaided.” In 1912 he returned for a while to England to recover from an illness. Nothing is recorded of Mr Knowles apart from the fact that he had 3 daughters [!]. The youngest, Letitia, became, on marriage, Mrs Versfeld. He returned to England in 1915 with the intention of volunteering for active service, but was rejected on medical grounds. He remained in England as a parish priest. Mr Roberts came to the parish from the Cathedral in Pretoria. Two years after joining the parish he volunteered for active service as a Chaplain, and the parish was cared for, in his absence, by Mr Roxburgh the priest at St Aidan’s. On his return, having been awarded the Military Cross, for his distinguished war services, the Parish welcomed him back with a Priest’s Vestry completed in stone on the north of the church. A new brick vicarage was also built, enabling the Roberts to leave the old corrugated iron and wood house that had served as a rectory since the days of the Carters. This was now let out for £60 p.a. Another small extension was made of the south side of the church, behind the pulpit and this housed the hand-pumped organ. Mr Roberts wrote to the parish before his retirement, to say that he and his wife Kathleen has spent the happiest years of their life together at St Luke’s, and to ask if their ashes could be interred in the walls of the church. This was agreed to, and the parish became a beneficiary in his will of £100. The ashes are in the north wall of the nave. Mr Chamberlain, who had lost his wife in the flu epidemic of 1921, took over from Mr Roberts. Within 2 years the debt to Mrs Carter was finally paid off – and the church was then consecrated on the Sunday closest to St Luke’s Day 1927, by Bishop Karney. The parish now extended as far as Halfway House. As the Rector’s transport was still a bicycle parish visiting could be a great challenge. After 5 years the parish bought the first parish car – a red fabric covered Baby Austin. The Rector, aged 62, learned to drive it on the road towards Pretoria. His two sons cleaned it, polished it, took it apart and put it together again in an effort to squeeze an extra mile per hour from it! One of these sons was also one of the’organ blowers’, charged with the task if keeping the organ in air whilst it was played. If they let it flag the effect they said was the same as a puncture in a set of bagpipes! In 1939 Mr Chamberlain was made an honorary Canon of the Cathedral. There had been no structural changes involving the church property for over 14 years. The pine trees planted in the early years of the parish had grown enormously, making the establishment of any garden around the church or rectory impossible. Council now approved the removal of these trees and, in their place, the planting of the present jacarandas and deodars. Mrs Wellington took on the task of beautifying the grounds with the establishment of gardens This was also a thanksgiving offering for peace and victory at the end of the year. In the same way new pews were built for the church in 1947 by Mr Morrison, a parishioner. Chirho Glover took over in 1948. The parish had continued to grow and with it the ministry needs. Within 3 years the old tin vicarage was dismantled and its place taken by a Parish Hall. This immediately led to an expansion of the Sunday School which, by 1957, had grown to over 200 young people. The Hall had been paid off by 1956 and the parish then decided to enlarge the church. The firm of Fleming and Cook, successors to Baker and Massey, designed the extention to the nave, the choir vestry, the tower with its rose window and gallery, and the tiling of the roof. The extentions were carried out by Mr W.H. Gresty, a builder in the parish. The enlarged church was dedicated on St Luke’s Day 1957 By Bishop Ambrose Reeves. Sylvia Glover was a wife of widespread talents. She was organist, choir-mistress, a leader in the Church Women’s Society, a church councilor a teacher and possessed of an irrepressible sense of humour. She was largely responsible for the design and construction of the present organ to replace the old hand pumped one. John was born in Johannesburg. His father was a Civil Engineer on the South African Railways – eventually becoming Chief Civil Engineer. They moved over a large part of South Africa and spent time in South- West Africa as well. John was educated at Bishops School in Cape Town and at the University of the Witwatersrand. He worked for a short while before answering the call to the ordained ministry. He spent three years at St Paul’s Theological College in Grahamstown, becoming Head Student there. He was ordained deacon in December1955, and priest in 1957. He served in a number of parishes in the diocese of Johannesburg, as well as in other dioceses. These included Christ Church, Mayfair [2 years], St Peter’s Church, Klerksdorp [2 years], St Andrew’s Church, Ermelo [4 years], St John’s Church, Roodepoort [3 years], St Dunstan’s Church, Benoni [6 years], St Luke’s Church, Orchards, Johannesburg [7 years],, St Katherine’s Church, Uitenhage [7 years], and St Peter’s Church, Sabie [10 years]. He retired to Sabie, and died later in the hospital in White River. His funeral took place in Sabie, and a Memorial Service was held for him at here at St Luke’s, attended by many of the people who loved him and whose lives he had touched with God’s love. John was a powerful and charismatic preacher with a great evangelistic ministry and a practical scholar. He conducted many missions in churches throughout the country, and was instrumental in bringing many people to Christ, and into a deeper relationship with Him. He was responsible, too, for introducing people and parishes to the reality of the life, gifts and ministry of the Holy Spirit. There are many people, now in different parts of the world, who have cause to be deeply grateful that they met him. One of their abiding memories of him is the deep bass “Hallelujahs” that were so much a part of his ministry and way of life. Peter was born and educated in England. 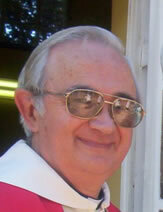 He came to South Africa in the mid 1970’s and was appointed the Rector of Christ Church, Addington. 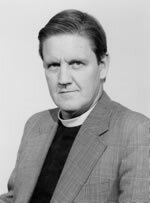 In January 1980 he was installed as the Rector of St Luke’s by Bishop Timothy Bavin. Peter’s great gift as a teacher was immediately recognized. Where John, the preacher and evangelist had ploughed the fields, Peter was able to plant the seeds. People responded with enthusiasm, many attending services in the morning and the evening with Bible and notebook ready. The Olive Branch Christian Bookshop was opened in Norwood. It very quickly became a laughter-filled meeting place, as people flocked in to look, to buy and then to read. The house churches started by John Spyker grew in number and flourished. In 1981 Peter invited Bishop Bruce Evans, the Bishop of Port Elizabeth to lead a mission to St Luke’s. Every home in the parish was visited in preparation, and the plans and events covered in prayer. The mission was another life changing moment in the life of St Luke’s. Many lives were touched by God’s love, people became more aware of the reality and ministry of the Holy Spirit, and people were blessed by the joy of the worship. The parish became more intentional in looking outward. A soup scheme was started to feed the hundreds of old pensioners in the long queues in Soweto. Most of them had been there all through the freezing winter nights as all too often there was not enough money for everyone. Money and clothes were collected for the resettlement areas in the Lichtenburg area, where Brian Germond was Rector. Vegetable seedlings were grown and transported there. Teams went up regularly to see and to help where they could. Two lay led missions were also sent to chapelries in the area. Peter also actively encouraged the development of the Youth Ministry in the parish. One of the major developments was the Youth Group ‘Freeway’ that met on a Friday evening, It catered for well over 100 teenagers. During this time Peter was also appointed the Rector of St Michael and All Angels in Alexandra. Curates were appointed, under his ministry and direction, to attend to the every day needs of this parish. This was a time of great unsettlement, and many confrontations between the people of Alexandra and the security forces. He continued and developed the parishes link with the Church of the Good Shepherd in Tladi, Soweto. Combined services and meals were held at both churches. Recognising the need and desire for teaching and training Peter formed SALTI – the St Luke’s Anglican Lay Training Initiative. Regular courses were offered to the many who wanted to extend and deepen their knowledge, faith and ministry. Peter also started the Anglican Mission Association, and was appointed Canon Missioner of the Diocese. After the decision was taken to multiply the Diocese of Johannesburg into 4 areas, Peter was appointed the Vicar General of what was to become the Diocese of Christ the King, to the south. He attended to the organization and formation of this new Diocese, and in the first elections was appointed the Bishop on 10 June 1990. Peter is married to Gill, herself a priest in his Diocese. They have 3 daughters – Clover- Anne, Sarah and Rebecca. Peter has recently written a history of the Diocese of Johannesburg entitled ‘Compromise and Courage – Anglicans in Johannesburg 1864 – 1999’. Jerry was born in Johannesburg, on 10 February 1943, the youngest of 3 brothers. He was educated at St David’s, the Marist Brothers College in Inanda. From there he went on to join the Syfrets Group where he stayed until 1972. He then moved to the Metboard Group where he stayed until his resignation in 1984. He was then a director of a major subsidiary. He came to St Luke’s for the first time in 1973 – to investigate the man his cousin had married, John Spyker. Here he stayed as John brought him to the Lord and encouraged and developed his spiritual life and ministry. He was licensed as a Lay Minister, served on the Parish Council, became a Church Warden and resuscitated and developed the Parish Magazine – The Bell. He was also accepted for training as a self-supporting priest. He continued to serve under Peter Lee and led a Lay Mission to Christiana as well as a preaching team to St Edmund’s in Kempton Park. He ran a number of Small Groups and acted as an Area Pastor to the Small Group Leaders. He was also a member of the ‘celebrated corps de clergy!’ – the others being the Revds Peter Lee, Richard Girdwood, Rob Jobling and Horace McBride. He was ordained deacon in St Mary’s Cathedral, on 12 December 1982, by Bishop Sigisbert Ndwandwe. He was ordained priest the following year, on 11 December 1983, by Bishop Timothy Bavin, also in the Cathedral. It was at this time that the Lord intervened and directed him into the stipendiary ministry. 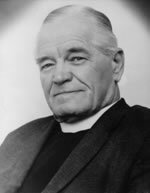 He was appointed an assistant priest at St Martin’s in the Veld in Rosebank, under Mervyn Moore. Here he and his family spent two and a half of the happiest years of their life. On Mervyn’s retirement he acted as Priest in Charge until Brian Germond took up his appointment as Rector. He returned to St Luke’s in late 1987 as assistant to Peter Lee. After Peter left to establish the Diocese of Christ the King, to which he was elected as the first Bishop, Jerry was appointed Rector of St Luke’s by Bishop Duncan Buchanan on 14 June 1988, During his time with St Luke’s he has also served on a number of Diocesan groups. He has been a Chaplain to the Diocesan Lay Ministers, Co-ordinator of the Diocesan Vision Implementation Team, Chairman of SAINTS – the Team focused on the development of the Ministry of the Laity –as well as designing and running workshops aimed at facilitating the implementation of Ministry Development Teams in the parishes. He also served as the Managing Director of the Olive Branch Christian Bookshop which operated in Norwood for 10 years. He is, in addition, Chaplain at St Mary’s School in Waverley. He takes weekly services on Wednesday, Thursday, Friday and Sunday, teaches Divinity twice a week, leads the Confirmation classes and is a member of the School Board. During his time at St Luke’s a number of property developments have taken place. The area around the church was landscaped and re-paved, the Rectory became the new Parish Centre and was renovated to make it more effective, the Robin Crawford Centre was built, the Wall of Remembrance was erected in the Garden of Remembrance, a small Hall, the Lighthouse Hall, was designed and completed mainly to serve the Youth Ministry. It has been so well designed that it has been used for many other uses and functions. After No 17A Orchard Road was sold, parishioners donated their home at No 36 Dorothy Road for use as the Rectory (also to be used for assistant clergy if needed). St Luke’s also contributed towards and arranged for the building of a new church in Christiana, to replace one appropriated by the State. The growing and developing ministry of the parish meant a growth too in the parish staff. A full time Parish Manager was appointed for the first time in July 2001. A full time Youth Pastor was also appointed in 2004. During this time too, 7 members of the parish have been trained and ordained. Jerry is married to Beryl [nee Dawson] a physiotherapist. They have 3 daughters – Catherine, who lives with her family in Perth, Western Australia, and Michelle and Teresa, who are both married and live in Johannesburg.